This last week has been a week in need of chocolate. Being without power in 100 degree heat is miserable at best. Luckily we were able to save all of the freezer and most of the fridge food thanks to kind friends that still had power and let us store items in their fridge and freezers. I also lucked out with literally buying the last two bags of ice in the entire store on Saturday. I have never seen such long lines at the gas station and fast food restaurants as I did this weekend. Thankfully we now have power, but I still know a lot of people including my in-laws who aren't scheduled to have power until the end of the week. Thanks to all this stress I baked cookies today. Whenever I start to feel stressed or have a major life event I bake. The phone call from my mother telling me that she had brain cancer started a two day baking session which resulted in over 15 dozen cookies. All my neighbors were thankful and it helped me to work through my feelings. I don't cry, I bake. So for all those people without power and trying to stay cool in the heat, I am sending some virtual cookies to you. Here is the recipe for Chocolate Chip Cookies from Eating Well Magazine which I baked today to relieve all the pent up stress leftover from the weekend. This recipe has 11 ingredients. It takes 35 minutes of total time, 10 minutes of which is active and makes 2 1/2 dozen cookies. All the ingredients are very basic and I already had everything in my pantry cupboard or fridge. For the chocolate chips I used semi-sweet since that is the type I prefer for baking since they don't make cookies overly sweet. I did make a few modifications to the recipe. Instead of grinding the rolled oats, which seemed time consuming, I substituted almond meal. I already had almond meal in the fridge, so it was a convenient substitution. Additionally, the recipe states to bake the cookies for 15 minutes. I baked both my cookies sheets at the same time, so I reduced the total cooking time to 10-12 minutes. Finally, I ended up with 2 dozen cookies, instead of the 2 1/2 dozen suggested. I followed the remainder of the recipe as written. My boys and I ate these cookies in less than a day. They really are delicious and I like that since they have whole wheat flour and almond meal I don't feel as guilty when my boys have seconds. These cookies stay small and don't spread out like traditional chocolate chip cookies, but the taste is perfect. Just don't look for the cookies to look like regular cookies when they are done or they will burn in the oven. With only 99 calories and 5 grams of fat per cookie, this recipe is a nice change from traditional chocolate chip cookie recipes. Great for a treat or an after school snack! For the recipe go to Chocolate Chip Cookies. 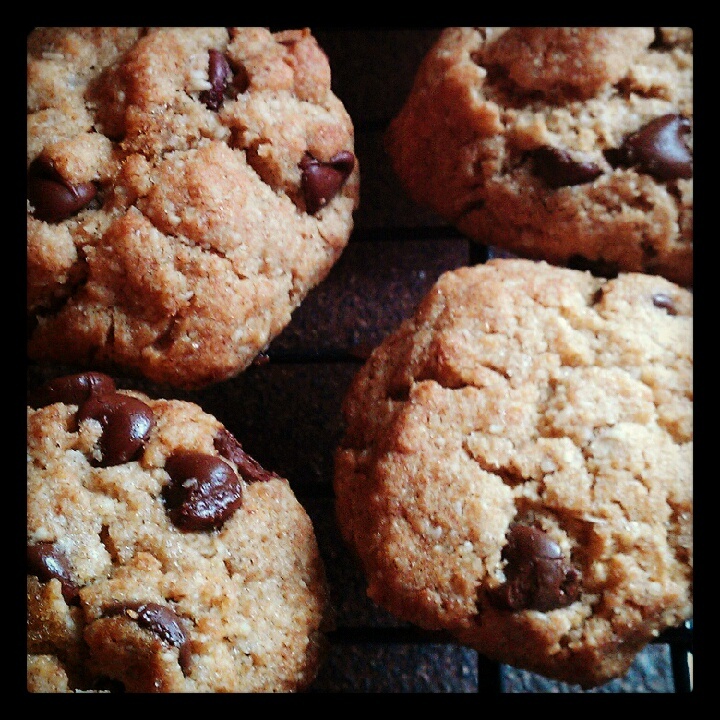 They were and I love that they use whole wheat flour and almond meal! So sorry to hear about your mom, though. It's never easy to deal with news like that, and there's no "right" or "wrong" way to react. 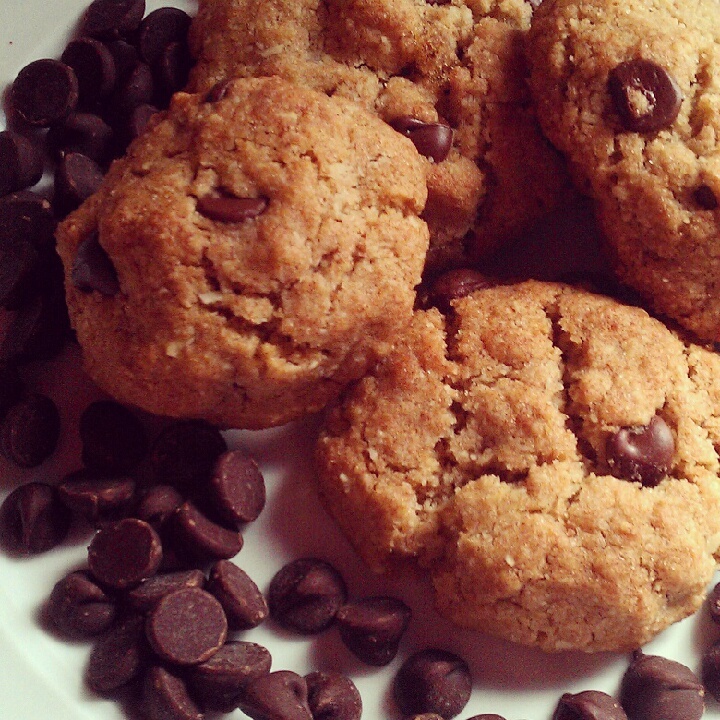 Thanks for sharing your cathartic baking with us. I'm a chocoholic also :) I agree it was hard to deal with the news, but she was able to fight the cancer until after I had my son and then passed away, so I am grateful for that! I have been using spelt flour when a recipe calls for whole wheat, and we are enjoying it very much. These look great, thanks! I use spelt flour a lot also, it's a great substitute! I'm so sorry about your mom. I want to try these! I've been wanting to do more baking with whole wheat flour and have never tried almond meal....have you ever tried a pie crust? I love using whole wheat flour and with the right recipe it works great! I made pie crust frequently, it is great with both whole wheat flour and regular all purpose. Glad you got your power back! That is no fun. I'm just like you...I bake when stressed and these cookies look like a yummy stress reliever! Pinning! Thanks for sharing and linking up, and my deepest condolences to you and your mother, I hope she gets through it! Those cookies sound divine, and being from Eating Well, I'm sure they are! She was sick when I was pregnant with my oldest and passed away nine days after he was born. I have lots of great memories though :) The cookies really are yummy! Ugh! So glad your power is back on! I know all too well how miserable it is without power in this kind of heat! Glad you were able to salvage your refrigeratables! I am so happy to have power!! Sorry to hear about your mom! And sorry about being without power. These look really good. Thanks for sharing on Foodie Friend's Friday! Please come back next week and share another great recipe! Thanks :) This recipe really is great!